It’s December 30th, 2010 and I’m in the Nepali village of Sauraha, on the border of the Chitwan National Park. 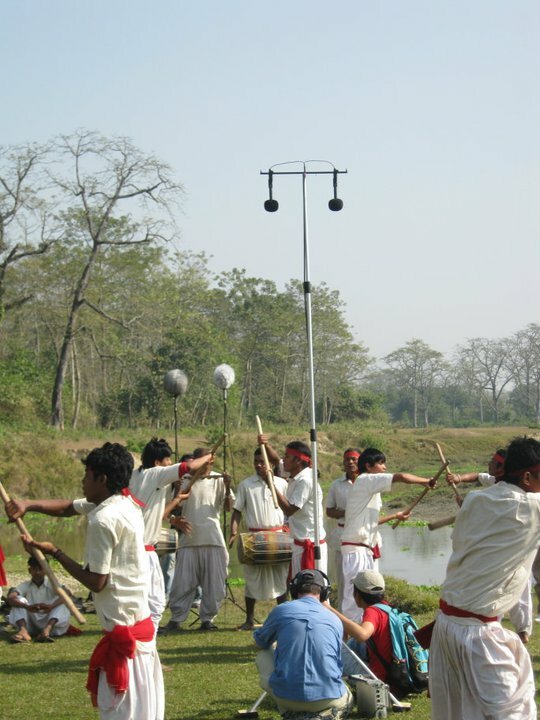 Today, after an Elephant ride through the jungles of the park (more on that next time…), we have gathered at the banks of the Rapti River to record the Tharu Stick Dancers. Having watched the dancers perform a couple of nights before, to a packed out and energetic (read: mic stand kicking) audience at the local cultural centre, I had a fairly good idea of what to expect. I had attempted to record the stick dancers on this night but it was quite fruitless due to the overly echoing room, their use of a PA, audience ‘participation’, etc. But today shall be different, I am prepared! A few of the buffalo, stopping for a drink. This recording really takes me back to the scene depicted in the first picture above. The width of the stereo image is really amazing, particularly when the man starts calling out to the left. I love the sound of the flowing water and the grunting buffalo crossing the river, shame about the motorbike that comes in at the end though! …As the herding party moves on up the river I hit stop and make my way back to the main group where the Stick Dancers have arrived. 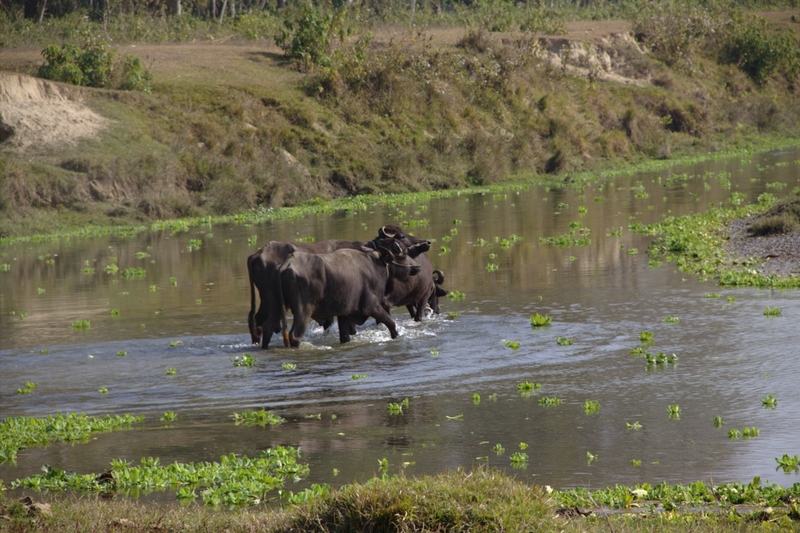 A number of the local villagers appear to have abandoned the buffalo and are hanging back to watch what we’re doing. We never fail to draw an audience it seems! First recording of the Stick Dancers. Looking to where everyone is now setting up, I find that Greg Simmons has decided to record the dancers using a spaced pair of DPA 4041 omnidirectional microphones into his Nagra V location recorder. He has positioned his rather tall mic stand in the centre of the performance space, with the mics raised high and pointing straight down (see picture on right). The dancers will then form a circle around him as they perform. I decide to take a different approach and set up my MS pair behind the musicians which are accompanying the dancers (see picture on right, again). Aiming the mics back towards the performance space and Greg’s set up, I am hoping to focus in on the Stick Dancers and use the off axis positioning of the musicians to balance their louder level. It doesn’t work very well. The image is horrible and unbalanced, and with the dancers moving around so much, often quite a distance from my mics, their relative level is all over the place. I stop and take a moment to reconsider my mic placement. After a moments consideration, I pick up my Manfrotto stand and walk it into the centre of the space, placing it next to Greg’s setup. I’ve decided that it will be impossible to record the stick dancers perfectly with my MS pair (the spaced omnis Greg is using are much closer to ideal for this situation), so instead I will focus on the musicians. I extend my mics into the air as high as they will go and angle them down towards the four percussionists. With this placement, the musicians will be the centre of the image and the dancers will move around it but remain the same distance from the mics at all times. The only problem now, will be the dancers moving to the rear of the mics where the null point occurs (I use a cardioid mid microphone in my MS setup), but what can I do, right?! Above is a quick video of the stick dancers in action. The audio here is just off the camera (so it’s average at best) but it gives you an idea of my final mic placement and how the dancers perform. Directly below is the recording I made. I’m fairly happy with how this recording turned out in the end. The musicians sound great and you get a good sense of movement from the Stick Dancers without it being too distracting or all over the place. Considering the limitations of my MS pair, I don’t think it could have come out much better! As for the performance itself; it is much more of a visual thing (being a dance and all…) so you don’t really get a sense of the awesomeness of it from the audio alone. But I do enjoy the beats and rhythms of it. 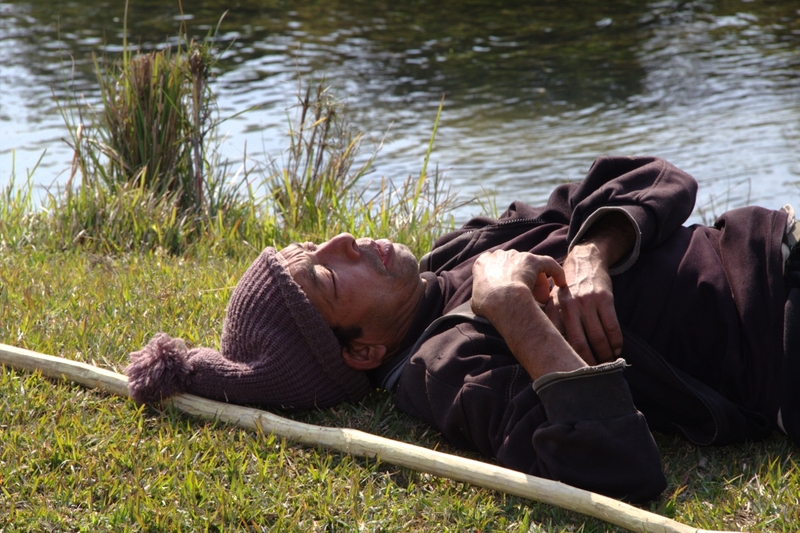 One of the local buffalo herders enjoying the afternoon sun. …As the dancers trail off and the pounding drums come to a silence I hit stop on my recorder and smile to Greg, happy with the recording I have captured. Watching the dance, seated in the very centre of the performance space was very cool, no better way to feel part of the action than actually being in the middle of it. And now it’s time to eat! Some members of the Holiday Safari Jungle Lodge, where we are staying whilst in Sauraha, have brought us fried rice for lunch. Everyone gathers around quickly and fills their white paper plates with mountains of delicious food. The Stick Dancers and musicians join us as well, indulging in the feast. A few tasty minutes pass before I shovel the last few morsels of rice down and lay back on the soft green grass to soak in some more of the afternoon sun. Around me the other GE-OS members are indulging themselves in similar activities and chatting with the local Tharu people. Life is pretty sweet. 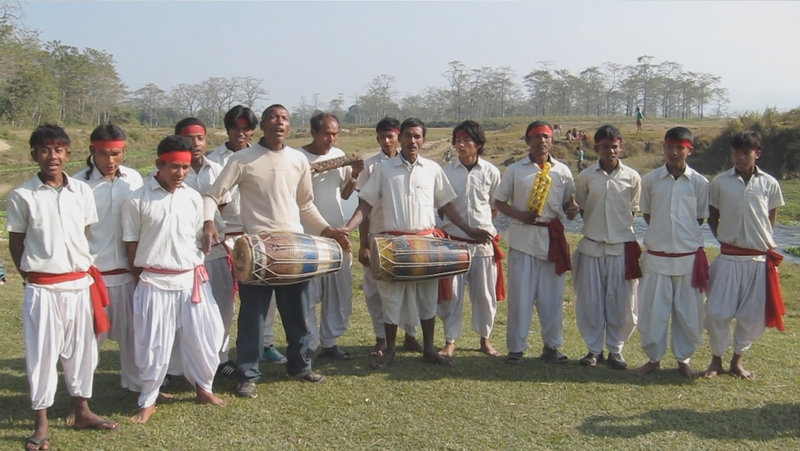 The Tharu Stick Dancers singing for us. I love these two recordings. At times they remind me of an American drum line, with the sharp attack and rhythms of the drums. They actually achieve that sound by tying paddle pop sticks to their fingers to hit the drum skin! The call and response style, particularly of the second song below, is also very cool. At times the recording seems to be a tad left heavy, unfortunately, that was due to the louder voices of the singers on the left and some of the boys on the right not singing at all! You can’t do a lot in situations like this without ruining the raw flavour of the whole thing, so best to go with what you have. …As the last slap of the drums come to an abrupt halt, we all clap and cheer as the performers bow graciously. Everyone is smiling, and why wouldn’t you be! It’s been a “fantastic”* day. Now to head back to one of the river side resorts for a ‘special’ lassi (more on that next time as well…)! * Greg Simmons, every single day of the GE-OS trip, 2010/2011. – All photos and video courtesy of Greg Simmons, Jarad Avnell and Carlos Rudzats. I am really enjoying your sound captures in places I will never go physically but can hear some of what is there. It is great fun and interesting. Who said education had to be dull? Enter your email address below to recieve updates on new posts. © 2019 Sydney Sound Recordist | Sound Designer | Sound Mixer All Rights Reserved. Sound Recordist | Sound Designer | Sound Mixer - Joseph Dutaillis.